We obtained this Limbertwig in the mid-1980’s from the late Henry Morton of Gatlinburg, Tennessee who was responsible for finding so many wonderful Limbertwig varieties. The tree is a true weeping type. 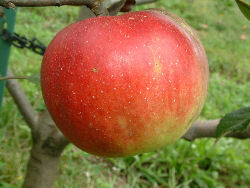 Fruit size medium to large with yellow skin overlaid with dark and light red. The crisp, highly aromatic yellow flesh is juicy and highly flavorful. Ripens September to October. How far south can smoky mountain limbertwig be grown. Vidalia Ga?? ?